A tough and tenacious centreman who could also be used as an effective shut-down player, Berkley Cox’s VFL career with Carlton was bookended by successful stints with City-South in Tasmania. Born in 1935, Cox first played senior football with City-South in the NTFA in 1954. The Redlegs were in the midst of a golden era under legendary coach Bob Miller, and it is a testament to Cox’s talent that the 19-year old quickly cemented himself as a regular senior player in a team that went on to win both the NTFA and State titles that season; Cox played a key role in both triumphs, booting two goals in the NTFA final against Launceston and being named best on ground in the state final against Hobart. The following seasons saw Cox continue his impressive development, chosen to represent Tasmania in 1955 before featuring in a second City-South premiership in 1956. After 100 games for the Redlegs, Cox was recruited to the VFL ahead of the 1958 season by Carlton, a club who were in the middle of one of their very few prolonged periods of little success. Though he played primarily as a centremen with City-South and Carlton, the Blues also saw Cox’s potential as a run-with player, and it was in this role that Cox would spend a large part of his eight-season career at Princes Park. 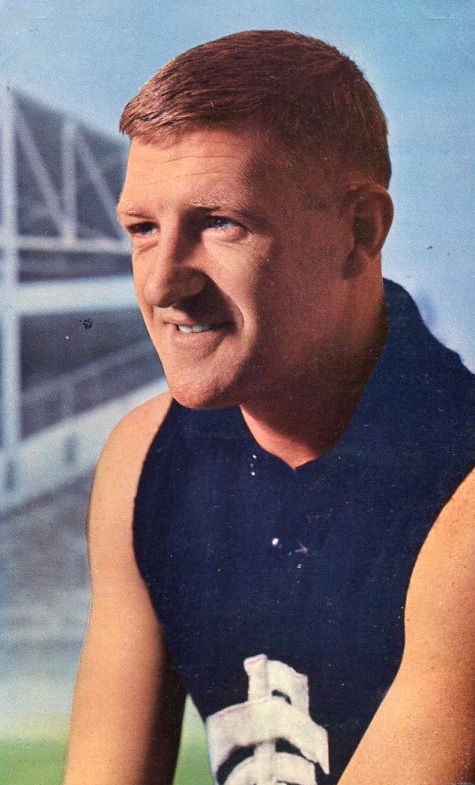 Cox’s best season in the navy blue was almost certainly 1962: after playing every game Cox was named amongst his side’s best in all four finals matches, including the drawn Preliminary Final against Geelong and the Grand Final loss to Essendon two weeks later. After 102 games for the Blues, the now 31-year old Cox returned to his native Tasmania for the 1966 season. As had been the case when he had left, City were a powerhouse side in the NTFA, this time under the leadership of former Richmond player Graeme ‘Dreams’ Wilkinson. In Cox’s first season back with the Redlegs, he featured in another NTFA-State premiership double (defeating Scottsdale and Hobart, respectively) and represented his state in all four matches at the National Carnival in Hobart. After a Best and Fairest award in 1967, Cox bowed out of senior football at the end of 1969, having spent his last two seasons as captain-coach of the team. He retired with more than 250 senior games to his credit – 140 of which came with City-South – and a name as one of the club’s finest ever players. Post-retirement, Cox was honoured with life membership of City-South and inclusion in the club’s Team of the Century, where he was named in the centre.